Jacobi’s individual and collaborative works are found in museums around the world, including the Museum of Arts and Design, New York, New York; Detroit Institute of Art, Michigan, National Museum of Modern Art, Kyoto, Japan; Stedelijk Museum, Amsterdam, the Netherlands; National Gallery of Modern Art, Rome, Italy; and Bellerive Museum, Zurich, Switzerland. 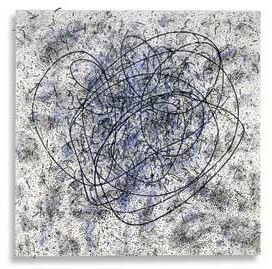 We are excited about exhibiting two quite different, yet representative, works by Ritzi Jacobi at SOFA New York. The tension and tactically in her work is always exciting for viewers. In Blue Zone myriad shades and tones of a single color create additional intensity. In Floating Matter there is a complexity of surface and structure — by summarizing cable elements in various techniques, the single particles generate a vivid, pulsating pattern. In either case, technique has become secondary to the overall composition. Next month, Rhode Island-based artist Wendy Wahl will exhibit branches, an imposing interactive sculpture constructed from discarded and deconstructed Encyclopedia Britannicas inside the Park Avenue Armory in New York for the Sculpture, Objects and Functional Art (SOFA) exposition. 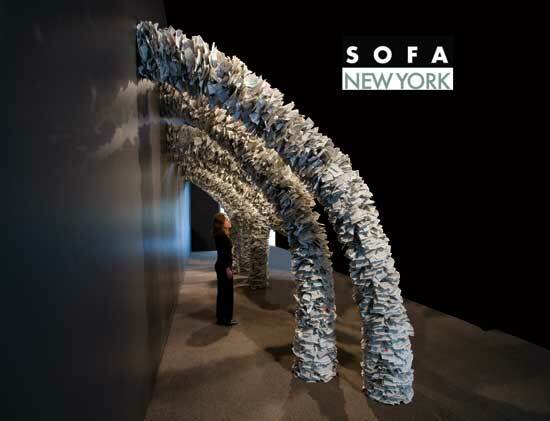 From April 15th through the 19th, branches will flank SOFA’s entrance inside the Armory and stand approximately nine-feet high, six-feet deep, and eleven-feet wide. Viewers will be encouraged to move through the sculpture, whose form and materials will serve as a contemporary reflection on the ancient idea of the Tree of Knowledge, “We are thrilled to have Wahl frame this year’s edition of SOFA New York with her provocative work that will doubtlessly energize veterans and newcomers alike,” added Mark Lyman, President, The Art Fair Company and Founder/Director of SOFA. “I love the materiality of books,” explains Wahl, “and branches is a tribute of sorts to a medium in transition. It’s a wonderful opportunity to continue my exploration at SOFA in New York City—the center of the rapidly changing publishing industry. I want the fair’s audience to think about how they get their knowledge and to question their relationships to the natural world. What are the connections between nature and language? How does the existence of a multitude of new ways to communicate alter our understanding of meaning and significance?” The installation will continue a series that Wahl began in 2005, which addresses a set of ideas including accessibility and accumulation, synthesis and sustainability. Previous installations in the series have appeared at the Newport Art Museum and the Bristol Art Museum in Rhode Island and the Fuller Craft Museum of Art in Brockton, Massachusetts. Wahl’s work is represented by browngrotta arts of Wilton, Connecticut. The gallery will feature other examples of Wahl’s work in its SOFA New York 2010 installation in booth 204. Wendy Wahl ‘s work can be found in the permanent collection of the Cooper-Hewitt National Design Museum (New York, NY) and the American Embassy in Tashkent, Uzbekistan (through the Art in Embassies Program). She has exhibited throughout the world at venues such as the Contemporary Jewish Museum (San Francisco, CA), the Newport Art Museum (Newport, RI), the University of Wollongong (Australia), and the International Textile Convention (Kyoto, Japan). Here are rare in-progress images of Helena Hernmarck’s major commission for Pao Hall at Purdue University in West Lafayette, Indiana. The finished work will be approximately 10 x 14.5 feet and is due to be completed later this year. Hernmarck was recommended to the University by Lisa Lee Peterson. 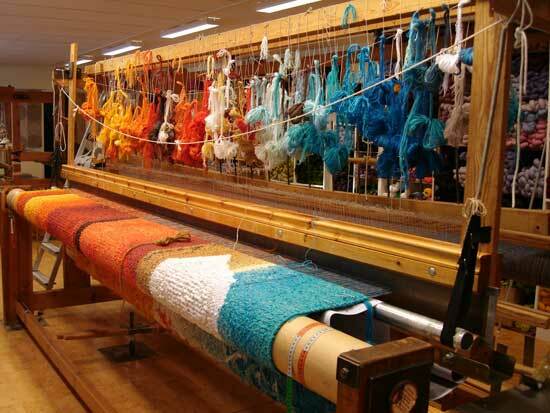 Peterson is an artist and professor in the Department of Art and Design in the Patti and Rusty Rueff School of Visual and Performing Arts at Purdue, where she has taught fiber arts and textile design for twenty-five years.